The American government's intervention via the Office of U.S. Foreign Disaster Assistance (OFDA) to train health workers in Liberia and Sierra Leone to prepare for and prevent the spread of the Ebola Virus Disease failed after six international organizations hired to implement the project delivered unclear results, a US government audit shows. John Snow, Inc. (JSI); International Rescue Committee (IRC); MENTOR Initiative; International Medical Corps (IMC); Jhpiego are the six international non governmental organizations the US gave $26,690, 551(twenty-six million, six hundred ninety thousand, five hundred fifty-one United States dollars) to conduct the training in the aftermath of the 2014 outbreak. About 24,799 people were infected and 8,765 killed in Sierra Leone and Liberia, according to the World Health Organization (WHO). 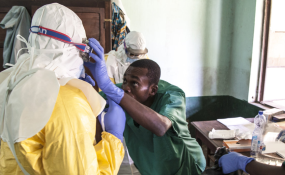 According to US auditors, the money was provided after the US Centers for Disease Control and Prevention (CDC) estimated in August 2014, that "without additional interventions or changes in community behavior," the infection rate in Liberia and Sierra Leone would be up to 1.4 million by 2015. USAID's Office of U.S. Foreign Disaster Assistance (OFDA) sought to train healthcare providers to change their behaviors as the disease spread exponentially due to the healthcare communities in the affected countries not consistently performing simple infection and prevention control (IPC) protocols such as patient triage and isolation, hand washing, and cleaning, the audit said. But according to USAID's Regional Inspector General/Pretoria audit released on November 21, 2017, OFDA cannot demonstrate that it achieved its goal to train and prepare healthcare providers to prevent the spread of Ebola. It said OFDA did not ensure that grantees reported accurate data and that data on the number of healthcare providers trained for three of the five grantees included in the audit were invalid and imprecise. "Grantees included in their results training provided under previous programs not funded by OFDA, did not retain evidence to support training results reported, and did not reconcile the number of trainees they reported with the number of names on sign-in sheets," the audit said. "Further, the grantees did not establish a process to prevent double counting of healthcare providers who attended more than one training on the same topic. OFDA did not verify results, contributing to poor data quality." Healthcare providers were on the front lines of the Ebola response. They needed to protect themselves not only to survive but also to keep from spreading the virus, and OFDA's grantees gave training to healthcare providers in Liberia and Sierra Leone to teach them. According to the auditors, proper implementation of IPC protocols is critical to fighting and containing the Ebola virus or any infectious disease. The USAID's Inspector General said, site visits showed that healthcare providers in Liberia were not consistently applying what they had learned. "Specifically, at all 16 facilities we visited in Liberia, healthcare providers were ignoring IPC protocols such as screening patients and visitors for possible exposure to an infectious disease before allowing them to enter health facilities, washing hands, and taking appropriate measures to contain and dispose of medical waste. "Although they confirmed that they had received training, the healthcare providers did not follow these key IPC protocols. Workers cited a number of reasons, including telling us the practices were new to them and would take some time to adopt."